It was unanimously decided to request Indian Air Force for granting Honorary Rank to Viswanathan Anand which will boost the youngsters in chess field as well as play pivotal role to encourage the youth to join the prestigious force to defend our great nation. World Junior (Open & Girls) Chess Championships:- India will be hosting World Junior & Junior girls Chess Championship at New Delhi from 14 to 26 October, 2019. In addition to the FIDE regulations, the following rules will apply to the AICF registered players who are desirous of participation. Top ranked player (Gold medallist) in the 2018 National Junior & Junior girls chess championship will be selected for whom the AICF will bear the entry fee, Board & Lodge, kit and reimburse 2nd AC train travel. 1. Participation in 2018 National Junior & Girls chess championship held at New Delhi will be basis for considering applications. Those who have not participated in the above championship are not eligible for participation. However, exemptions are given to the following category of players. Note: The following players will play as special entries. (b) 2018 World & 2018 Asian Medal Winners in Under-16 and Under-18 (Standard format) Open & Girls categories respectively. (b) Players having personal right (seeding) as per the championship regulations. 6. Players should bear travel expenses, board & lodge on their own. However, the organizers can provide board and lodge on payment basis as per tournament regulations. 7. 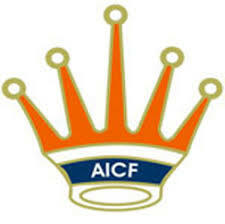 All players must be registered with AICF for the year 2019-20. World Youth (Open & Girls) Chess Championships:- India will be hosting World Youth Chess Championship at Mumbai from 01 to 13October, 2019. In addition to the FIDE regulations, the following rules will apply to the AICF registered who are desirous of participation. National Team Chess Championships:- The prize money for the Open team championship has been increased to Rs. 2,25,000/- while the women prize money has been increased to Rs. 1,50,000/-. Every state now can field maximum up to three teams only and needs to play the event with suffixing ‘A’, ‘B’ and ‘C’ to their state name. No other names for the team are not allowed. The special affiliated units can field maximum two teams while the host state will have one additional entry apart from allotted three. 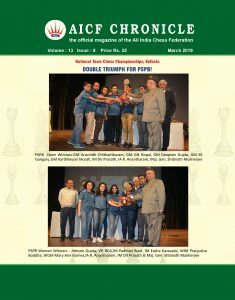 National Schools Championship:- For the year 2019, the winners of the National Schools Championship to be held in Raipur in April will qualify for the Asian and World Schools Championships for the year 2019. Another edition of National School Championships will be held in December 2019 to determine the qualifiers for the 2020 World and Asian Schools Championships. From 2020, the medal winners of the National School Championships will qualify for the next year’s World and Asian Schools Championships.